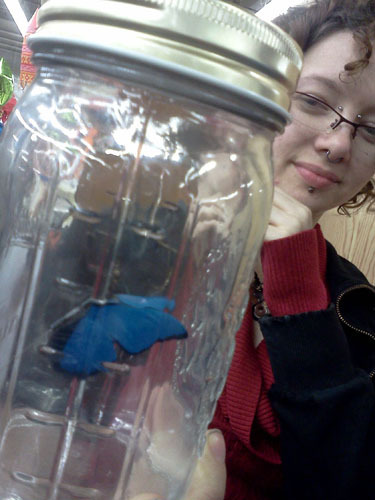 As a visual artist, I sometimes feel like a minority at the Artisan's Asylum. This 40K sf. converted envelope factory is home to over 200 members who either work in shops (wood, metal, glass, jewelry) or with new technologies (3D printing, laser cutters, computer controlled routers called shop bots) or on bikes, leather, electronics and much more. 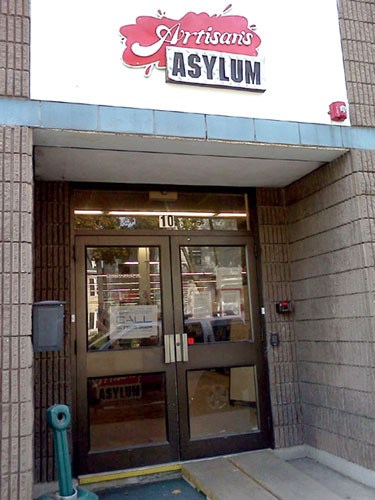 The Asylum is a place where you can take a class or develop a business. It is considered an incubator for innovation and entrepreneurs by some. For me it is the place I go almost everyday, were I am surrounded by creative people making things, not un-like a medieval guild. Having access to tools and knowledgeable people makes The Asylum an environment with endless creative possibilities for me, but it can also be overwhelming for someone who has a hard time focusing. It's thrilling to learn about 3D printing, software programing and electronics, but not having studied physics or computer science, I can feel pretty ignorant. When someone tells me about their project, I need to stop them at the first step because I don't understand how a change in temperature could activate a switch or how playing your recorder attached to a computer can result in notation and sound files you can then use in loops. I was already working with obsolete technology when I came to The Asylum looking for a work space. Little did I know what a perfect match it would be. 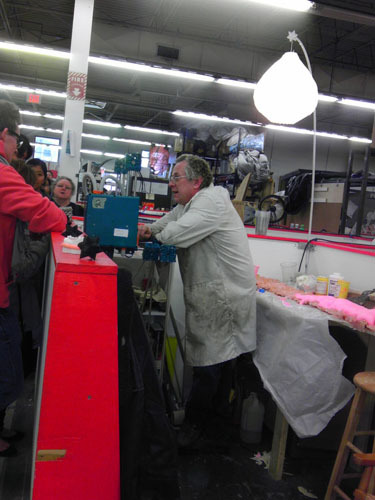 The first thing that tipped me off was when successful inventors and PhDs joined me for "take apart sessions. 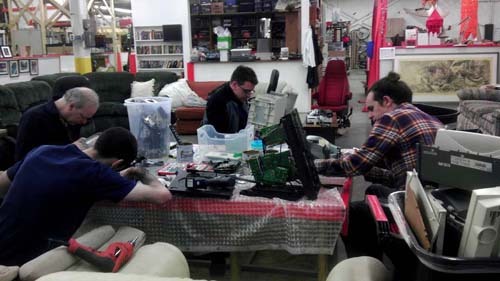 They told me they enjoyed disassembling old computers and that as children this was how they first became interested in what they do now. 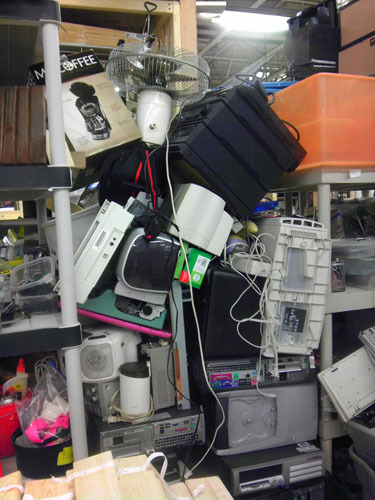 Even though we come from different backgrounds, no one looks at me like I'm crazy when I use old computer parts in assemblages combined with collage. Or when I hung little wooden reclaimed chairs, painted in primary colors from the 50 foot ceiling. 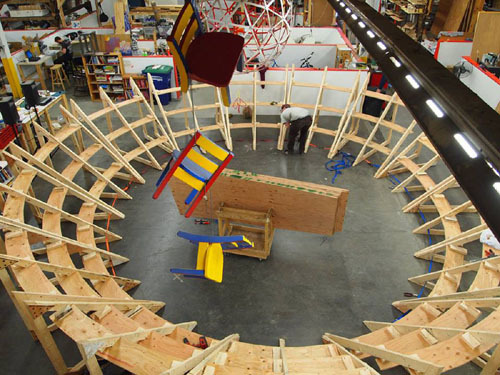 Seen here during the construction of the Veladrome, which bikes rode around demonstrating the power of centrifugal force. This is an awesome video of the building of the Veladrome in fast motion and put to music. The best thing of all is that these ingenious, talented people are kind and generous with their knowledge. Working out of the Asylum has had a tremendous influence on my work and I am learning new skills all the time. At first, I used gears as a decorative element in my work, then I leaned to use battery powered motors to make them move. Currently, I am converting computer cooling fans to be reversible in a piece that combines purple glass tiles and collage. My next blog will be about the collaborative project, The River of Connectivity, a 6ft x 4 ft Hacker Creation with 8 moving fans controlled by an ardino processor!